Donald Trump seems crankier than usual. The guy’s not known for his sunny disposition, mind you — his most common form of interaction is to beat the crap out of someone or something and then say, “but I like the guy!” — but even by Trump standards, the past few days have been unusual. He is, in fact, doing pretty well right now — just not as well as he had been. In a CNN/ORC poll released over the weekend, Trump’s support fell significantly from CNN’s last poll, conducted right before the second Republican debate. You can see the downturn in the Real Clear Politics polling average. Trump’s support dipped a bit, thanks to that CNN poll — but so did his lead. At the end of August, he was up by almost 15 points. Now that has dropped to 10, and is trending the wrong way. As is his way, Trump took to Twitter to register his annoyance. First, on Sunday, he lashed out at Carly Fiorina, who saw the biggest jump in the CNN poll released that day. Then, on Monday morning, he got mad at the “Today” show for referring to CNN’s poll instead of one conducted by NBC in concert with SurveyMonkey. Those willing to join in his critique earned a much-sought-after retweet. 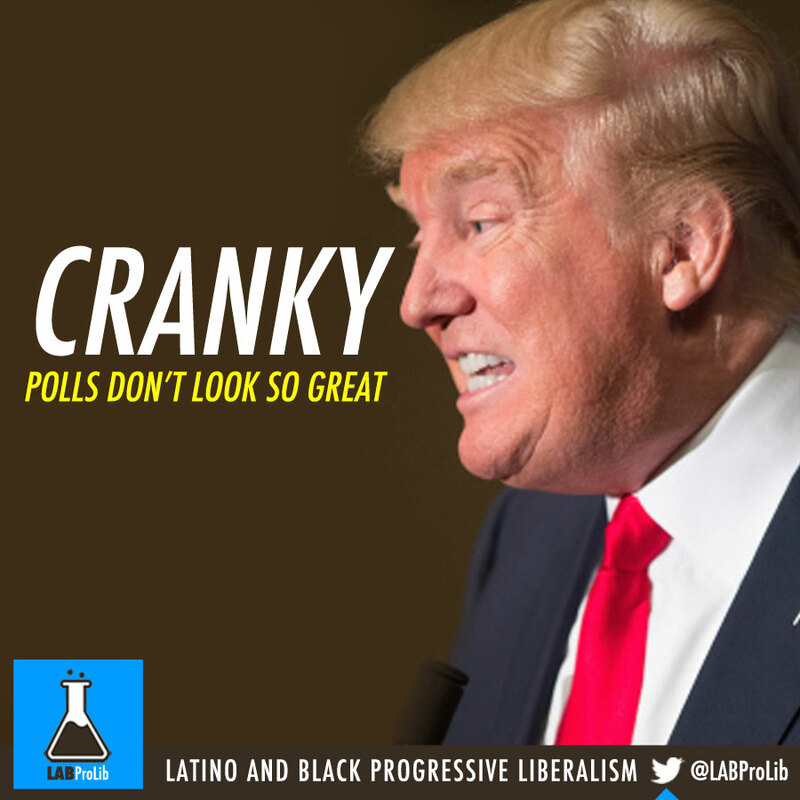 Trump also repeatedly pushed another poll by John Zogby that came out on Monday. By Monday night, though, he had a new target: Fox News. 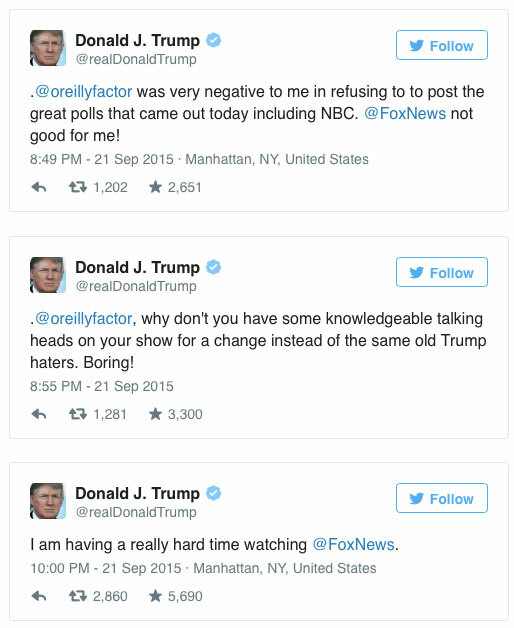 Fox’s Bill O’Reilly, it seems, also had the temerity to cite CNN’s new poll and then had Trump critics weigh in. Between 8 p.m. and Tuesday morning, Trump had tweeted or retweeted 20 criticisms of Fox News — and also one woman bemoaning the “lynching” of Trump. That is an unusual level of fury, even by Trump standards. What’s changed? First and foremost, that CNN poll reversed the idea that Trump continues to build on his lead. Second, he had someone to blame for that change: the Club For Growth. Trump hasn’t faced much direct criticism or many real roadblocks over the course of the campaign. Now he does. What’s more, it seems that the public fascination with his campaign is also fading, potentially making it harder for Trump to rely on free media to prop up his presidential bid. More than half of all Republicans said that Trump has the temperament to be president in the most recent Washington Post-ABC poll. Tweeting at Fox 20 times because he dislikes their analysis doesn’t really bolster that claim.